← Queen, Countess, and Paupers. 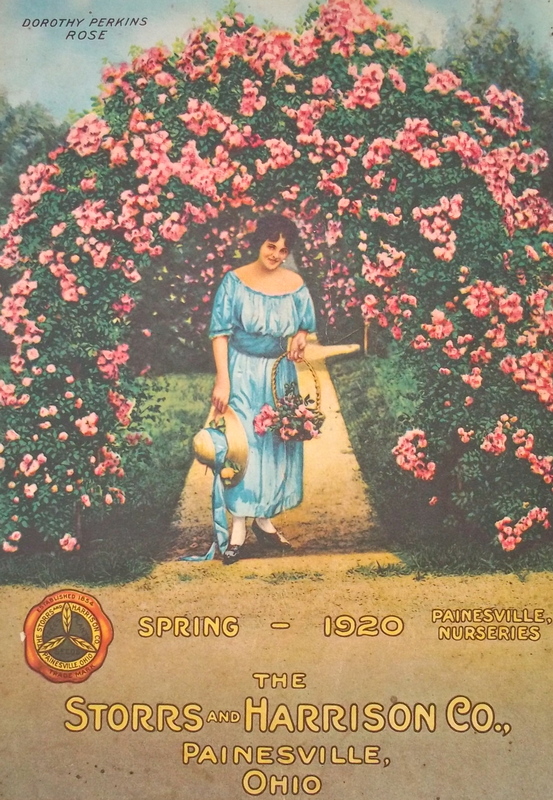 When the rose was more famous than the shop – an American plantsman’s catalogue of 1920 from my own collection. There are fashions in rose cultivation, just as there are in habits, costume, and coiffure. A nameless, ancient, pale shell pink rose used to ramble at will all over the old brick barn where my dad’s family lived at Keepers Cottage, Footherly. It had been planted in some distant season without reference to the preferred palette and naturalistic planting schemes popularised by Gertrude Jekyll at the turn of the 20th century, even though it typified them. “iceberg,” “Blue Moon,” “Peace,” I could recite the names of all my mother’s roses. 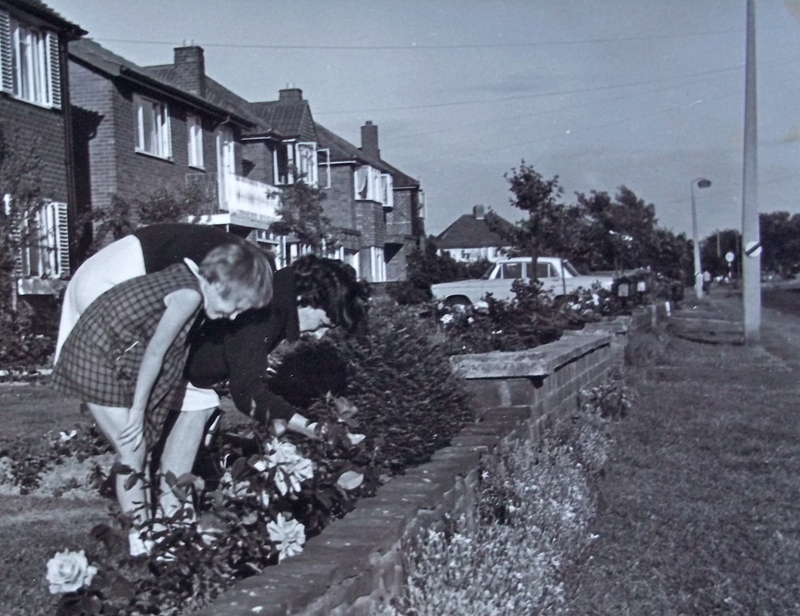 At the front of 155, Bosty Lane, Aldridge, in the 1960s. I was a young child when my mother lovingly stocked our front garden at 155, Bosty Lane, Aldridge with all the latest varieties of “Hybrid Teas”. We really appreciated their virtues: the exquisite form of the bloom, with the classic pointed bud, whose shape endures as the petals around it unfold, and the startlingly intense colours of the latest introductions: “Uncle Walter”, (1963) , a vivid red; “Grandpa Dickson”, (1966), sunny yellow – and “Blue Moon”(1964)- in reality a blueish violet, but even now the nearest approximation of the elusive blue rose. “Ena Harkness” invited a diminutive Susan to lean in to its ruby flowers to inhale a powerful fragrance, undaunted by the earwigs lurking at the base of the petals. Hybrid Tea roses are sparse of foliage, and whole beds of them present as a dismal cluster of bare, upright sticks in the winter months, because they sulk if underplanted. These shortcomings mean that are now out of favour with gardening cognoscenti. All roses, from the wild dog-rose to the florist’s confection give me too much pleasure to criticise them for their faults, unlike Vita Sackville West, who really had it in for a rose called “Dorothy Perkins“. This endearingly bright Barbie-pink rose, a generous bloomer, she described as an “old enemy”, in her column for “The Observer,” and as “… a blaze of color; a long, angry, startling streak … I blink on seeing it; and having blinked, I weep.” Oh dear! The “real” Dorothy Perkins was the grand-daughter of American rose-grower Charles H. Perkins, who named his creation after her back in 1901, fostering a trend for naming roses after people. The vigorous plant immediately began to win prizes, and become so famous and popular that the H. P. Newman Stores changed their name to “Dorothy Perkins” in 1919. Nearly 100 years later, the name “Dorothy Perkins” is still emblazoned on shopfronts the length and breadth of Britain. I reckon I would have been about 16 or 17, in the 1970s when I first sloped in to make a purchase of a pretty blouse or some lacy tights in the Dotty P. shop in Park Street, Walsall, but a member of my family had crossed that threshold some 25 years before at a similar age, with much more purposeful a step, let alone far superior deportment and grooming. My Aunt, Irene Thackeray, nee Sheldon. Born Walsall, 1932. 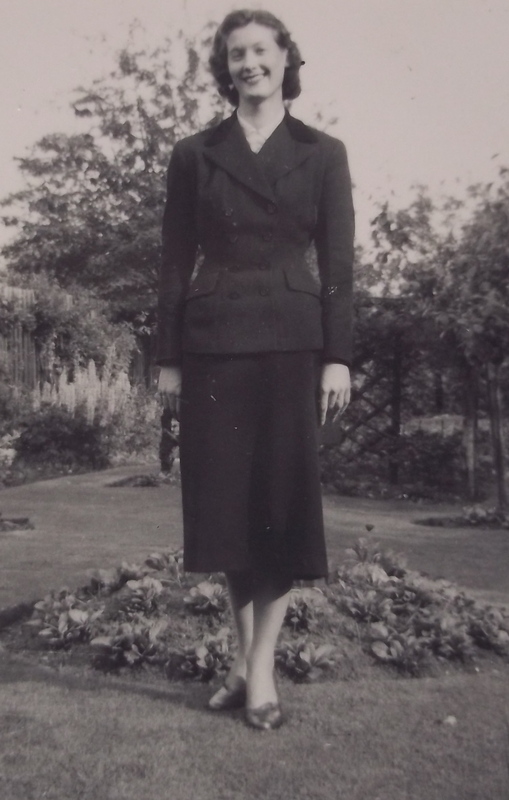 My mother’s next youngest sister, Irene, was a tall, slender, personable girl in a cheap print frock when, she recalls, she was making herself useful by running errands for a near neighbour by the name of Mrs Alice Brown. Mrs Brown was the manageress of the Walsall branch of Dorothy Perkins, and, despite Irene’s tender years, persuaded her to be recruited into the sales force as a trainee manageress. At first, she was obliged to sport the dreaded greeny-beige button- through uniform of the sales girls – “it was horrible, like a prison dress,” Irene says vehemently. Soon, in deference to her training she was allowed to wear her own outfit of an impeccably tailored dark suit, and stylish peep-toed court shoes. She relished the fact that her income enabled her to choose her clothes for the first time in her life. 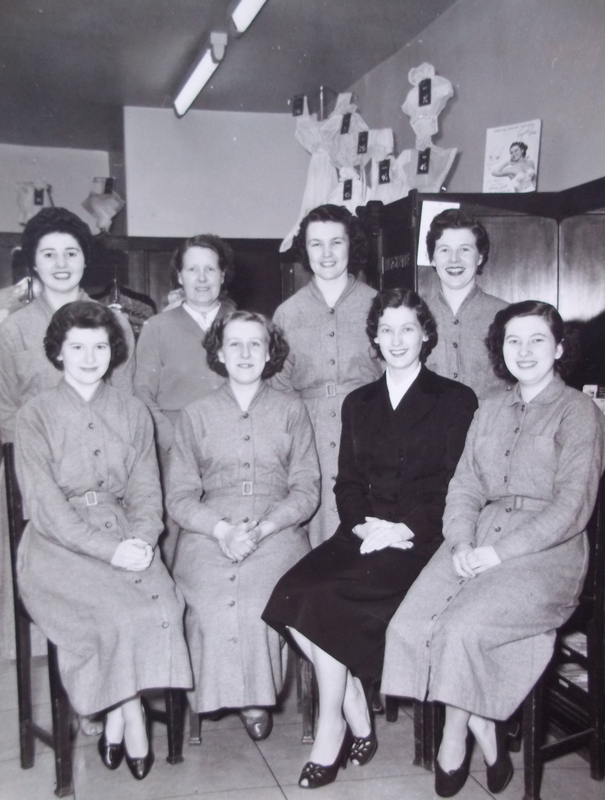 The staff of the Walsall branch of Dorothy Perkins in the early 1950s. 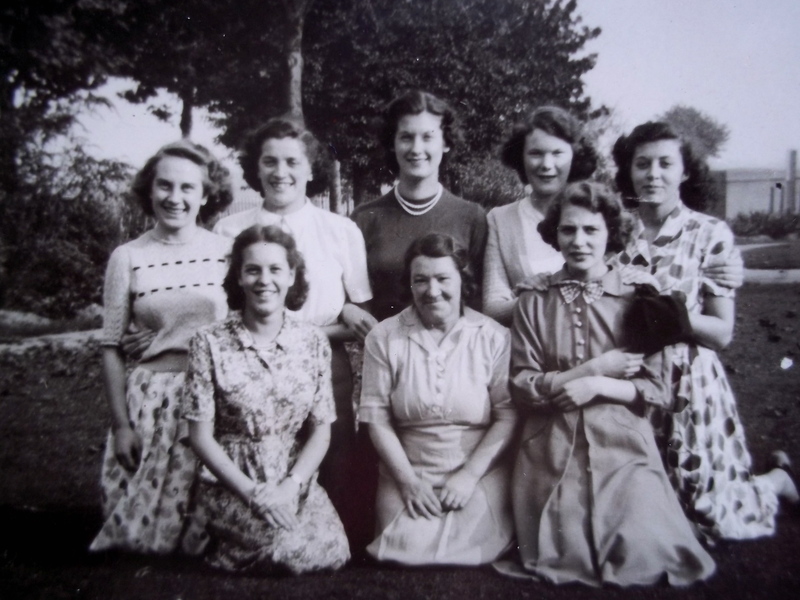 A young Irene Sheldon, second row, left, has one hand on the shoulder of Mrs. Rathbone, the cleaner. Mrs. Brown, manageress, is at the front. If dainty, now obsolete items of trousseau such as bed-jackets and girdles had been your desire in 1950’s Park Street, you would have been greeted, Madam, at the door of the Dorothy Perkins store by a young lady at once uncannily similar to my mother, but, in Mother’s own words, sweeter and more ladylike. In the role of “First Hand”, the elegant Miss Sheldon would then have shown you to the department you required, be it hosiery, corsetry, blouses, nightwear, or the comprehensive range of knitting yarns which Dorothy Perkins purveyed at the time. Miss Butler, Miss Brazier (whose husband never allowed her to wear make up) or Miss Cooper with their proficient knowledge of the stock behind their own glass counter, would courteously have served you, and neatly hand written the record of your purchase – each ticket being countersigned by the manageress. A dedicated cashier would have completed the financial transaction. Mrs Rathbone, the cleaner, was an integral member of the team, and appears prominently on group photographs of the staff. I remember Mrs Rathbone in later life as she lived next door to my grandmother in Bentley. She was the matriarch of a large family, which, I was uneasily aware, struggled against ill health and poverty. The Dorothy Perkins girls of Walsall on an outing in the early 50’s at an unrecalled location. 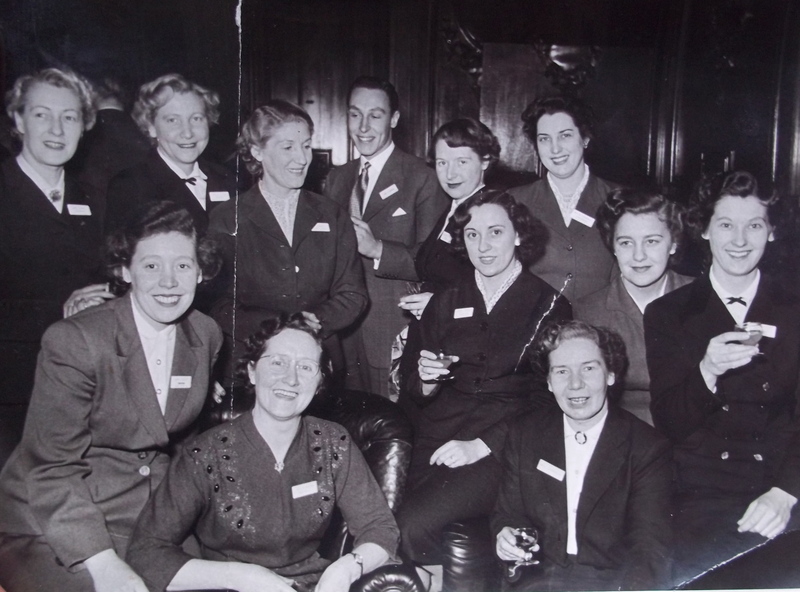 Trainee manageress Irene Sheldon is centre back, Mrs Rathbone is centre front. When a relief manager was required at West Bromwich, the company had an opportunity to assess Irene’s ability to run a shop. Acquitting herself well, and not quite nineteen years old, she was offered the position of manageress of the Worcester branch. Reassured that The Church was able to find a respectable Catholic family for her to board with, my grandfather gave his permission for her to go. Mr Farmer, a member of the family which owned the company, made regular visits to the larger stores, including Worcester. He was also present (and it looks like it is a terrible chore for him) at a conference attended by Dorothy Perkins manageresses and area supervisors from far and wide. Worcester seemed cosmopolitan to Irene after Walsall, but arriving by train in London she feared to leave her hotel at all, in case she got lost in the streets of the capital. A coach arrived at the hotel in the morning to transport the delegates to the impressive Ashridge conference centre in Hertfordshire. The Worcester branch of Dorothy Perkins, managed by Irene Sheldon, photographed for the company magazine. …..but then this started happening as well. What a lovely piece, thank you! I too have fond memories of Dotty P, in the early 60s it was a good place to see the ‘latest’ fashions! I have just come across you article which has made me smile. I am the youngest Grand-daughter of Alan Farmer. 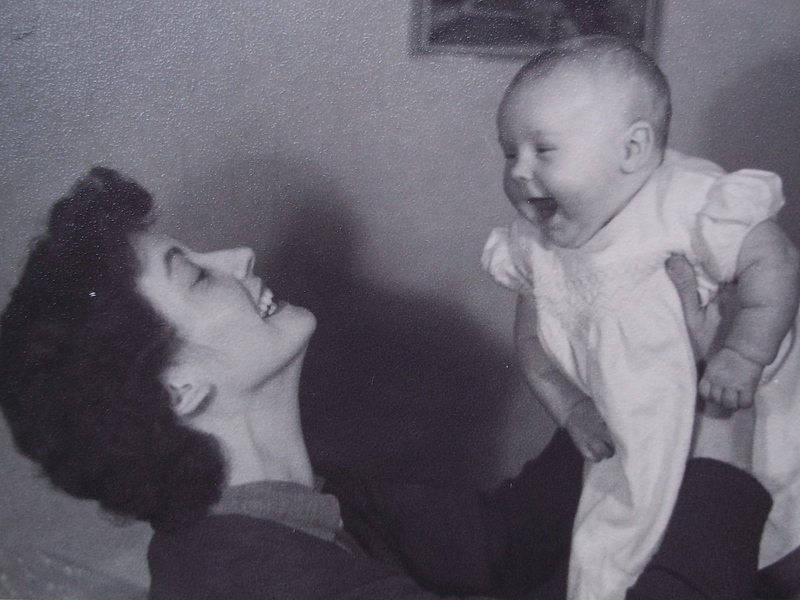 the founder of Dorothy Perkins and the niece of Ian Farmer, photographed in your picture. It was lovely to be able to grasp a little history from you and for that I am extremely grateful. My Mum, Alan Farmer’s daughter always had a Dorothy Perkins Rose in her gardens; infact roses were her very favourite! Small, small world. Mrs Rathbone is my Auntie’s mother. How nice to hear of the connection. She was a lovely woman, as you can see from her sweet expression. I guess many gardens had an Uncle Walter rose, but ours was a present from Dad’s brother, Uncle Walter! 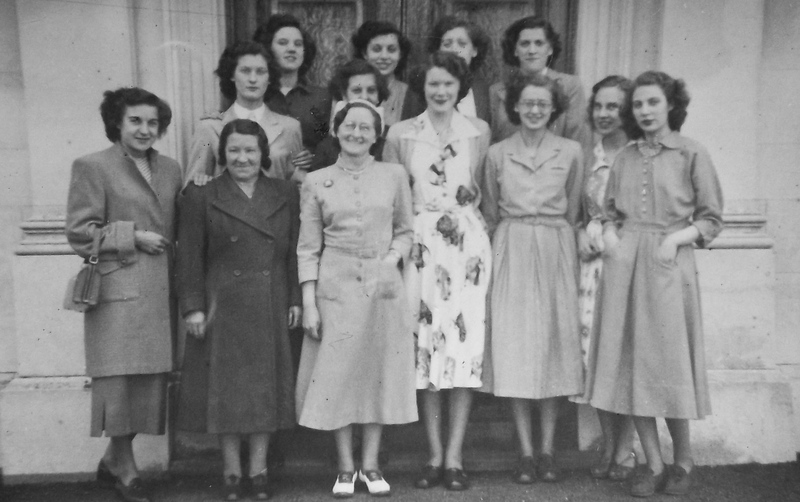 In the 1950s photo the tall lady front centre looks familiar, but I can’t place her. Your Uncle Walter sounds terrific! Thank you for your comment, Andy. I’m very pleased that you enjoy the blog. I have just been researching the “old Dotty P” and came accross this article which has made my mums day! Although we are from London it has brought back many memories to her. 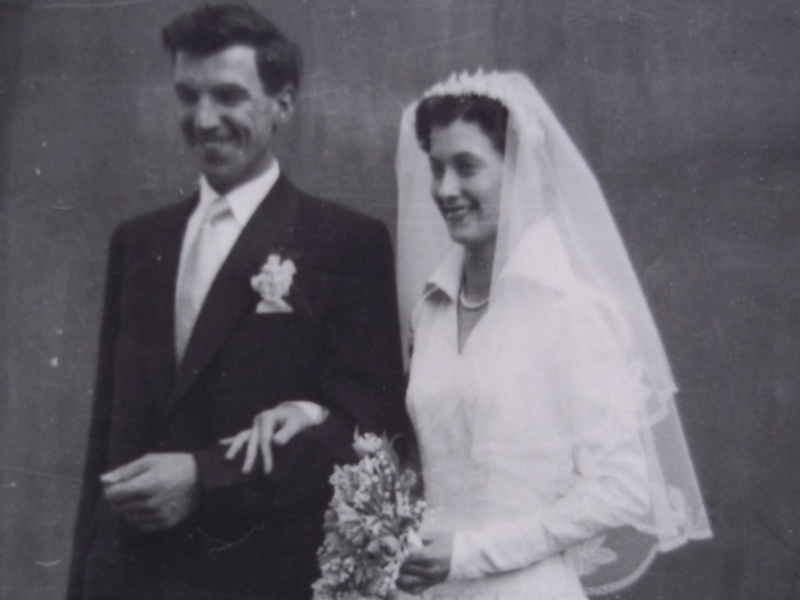 She is now 88 and stated off in their warehouse at the age of fourteen and a half and worked her way up to become a buyers assistant for a Mr Farndon and Miss Betty Wood who were the buyers for knitwear, swimwear and dressing gowns, dresses and blouses. Mum thinks the number of your store was then no. 73!! She also used to attend the conferences at Ashridge Park, helped to put on the manekin display. She remembers well Mr Farmer who was very generous during the war to them. Mum left there in 1950. There was also a son called Ian Farmer who his father, Alan Farmer, made him start his training from the bottom. How interesting – happy days for my mum. Mum used to visit many stores but mainly in London. She enjoyed reading your article – thank you. What about that!!! Thank you very much for the feedback, and kind regards to your mother. My Mother, Betty Storer, was nanny to the Farmer children in Walton on Thames in the late 1930’s. She met my Father whilst working there. He was Mr.Farmer’s chauffeur. Lovely story behind the name of Dorothy Perkins, which I did not know about. Glad you enjoyed finding out about the naming of the stores, Val. I am very interested to hear about your connection with the Farmers. How very interesting. I am the grand-daughter of Alan Farmer. Your Mum must have been my Mum’s Nanny. My mum was called Anne and she had a brother Ian who was two years younger than her. I think at that time Alan was married to Elizabeth (Betty) although they did divorce later and indeed she married Cedric Vaughan who I seem to re-call lived in Walton on Thames too. How wonderful that your Mum met your Dad while he was working for my Grandfather too. Such interesting stories. If you have time please share a few of them with me. Dawn, I am just doing some more research on my Mother, Betty Storer. I have found the electoral roll for 1939 and discovered she was not the nanny for Alan Farmer but a domestic servant. Her sister Nancy Storer was Alan Farmer’s cook. I am wondering if you know of any photographs that may be in your collection, or others, of my Mother and Aunt during their time with the Farmer family? I do not have any stories I am afraid. I do know that my Mother was very happy working for the Farmers. I have just been researching the history of Dorothy Perkins the company as at 16 i started working for the first time, at the head office which was in bracknell berkshire as a bought ledger clerk 3 years later i became buyers assistant and then a merchandiser. when i started there in 1971 Alan and Ian farmer were still owners and directors. it was a great company to work for and i stayed for 7 years until starting a family. the really funny thing is my husband and 3 sons have been extending and refurbishing a house that would you beleive mr. Ian farmer could be interested in. I couldn’t beleive it . I have actually sent a christmas card hopefully to be received by himself and mrs.farmer. I really feel so excited as i really would love to meet with him/them, as i have got so many fond memories of the company the farmers and all the excecutive employees that he would have known well, and lots of other nostalgic memories regarding all aspects of the company. I do hope the person will pass on the christmas card. i will let you know if i manage to contact him in the future. Very interesting! Thank you for commenting. I too was doing a little research about Dorothy Perkins and was delighted to come across this article. I am Alan Farmer’s youngest grand-daughter, Ian Farmer’s niece and have taken much delight in finding out about my family. My father died in 1972; he ran a knitwear company in Cheshire and Ian Farmer came and helped my mother run the same for several years. I do hope that my Uncle Ian and the second Mrs. Farmer, received your Christmas card. I, myself still receive Christmas Cards from him but since my mother died have not seen him and have very limited contact wit him. If you have more memories to share and have time to share them with me I would love to hear your stories. What an interesting read….I am currently the Head of Learning and Development for Dorothy Perkins. We are about to embark on some new customer service training and want to make a big deal about the heritage of the company. If you have any historical pictures of store teams, stores or adverts I would really appreciate it. Hello Mr Richens, just a short note to say my mum thinks she MAY have some old pics of some of the “buyers and their assistants” and poss an old model picture of swimwear in their monthly magazine and stories. She was a buyers assistant and you visit branches. Will see what she can find. She started in 1939 and finished in 1960 – she will be 90 Nxt month ! Thank you for your replies. Unfortunately, I do not have any stories/photographs to add as my Mother did not enlighten me on her life as Nanny to the Farmer children. It would be wonderful if someone, somewhere did have pictures of the Farmer Nanny, i.e. my Mother Betty Storer. I enjoyed this article so much, even though I landed on it looking for information about the rose. For this soon-to-be OAP with memories both of my own mother’s tea roses in the sixties as well as of suffocating (for a small boy) visits with her to the Dorothy Perkins shop in Weybridge, it was a delightful read. And I got the info I wanted about the rose too. Thank you. You are welcome, Ian. Thank you so much for reading……I feel tempted to do more writing when I get such lovely feedback. I purchased a house in West Moors, Dorset. I have been told by neighbours and the vendor that the house was built for and lived in by Dorothy Perkins the clothing retailer. Her real name Mrs or Miss Hames, which is entered on the deeds. Obviously I was interested in this piece of history, and have researched it on the web, but unable to see any reference to her name or any connection to this part of the country. Could anyone enlighten me on her connection to my house, to verify what I have been told.